IT'S the spirit of Bundaberg and it's about to go global in a $20m campaign. Bundaberg Rum's newest television advertisement, titled Unmistakably Ours, is a crusade to bring back Australian pride. The campaign focuses on Australian values starting here in the Rum City, mateship and true blue attitudes, with messages like "no one does life like us" and "have a crack". The ad will premiere tonight during the first match of the 2017 NRL season on Channel 9. The Bundaberg Distillery and its local employees feature in what is Bundaberg Rum's biggest campaign in a decade. 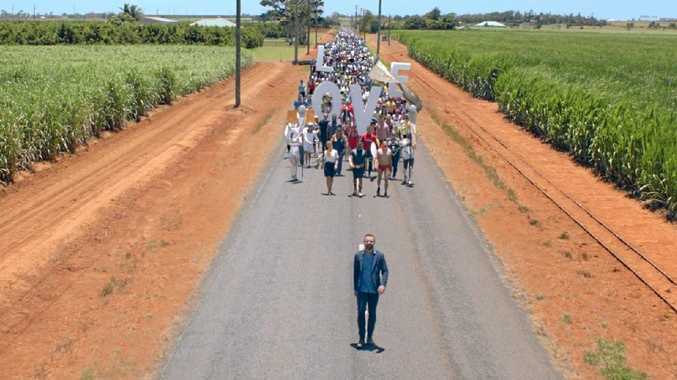 Diageo Australia, which owns the distillery, today released the 90-second commercial, which was filmed in and around the canefields of our great region and the Bundaberg Rum Distillery. There are celebrity appearances from Gyton Grantley, best known for his role of Carl Williams in Underbelly, surfer Julian Wilson, Olympic champion Anna Meares and even Bundaberg basketballer Willie "Shack" Shackleford. It's the spirit of Bundaberg and it's about to go global in a $20m campaign. With celebrities coming to the rum city to shoot new commercial. Grantley and Meares travelled to Bundaberg to film the commercial earlier this year. The advertisement starts with a Yank and a Kiwi picking on the pride of Australia before Grantley bellows "No, I can't take this,". "Aussies talk about mateship but they are always knifing their prime ministers in the back," the American says. "We can't let our statue slip, from Albany to Bundaberg isn't it time we stood up for values that made us famous?" Grantley asks. The campaign celebrates things that make Australia unique, from wildlife to food, love of sport, our beach culture and diversity. The aim, a Diageo spokeswoman said, was to unite Australians by reinvigorating love and pride for the Australian spirit - both for iconic Bundaberg Rum and the values that make us who we are. Grantley reminds viewers about the importance of Australia's enduring values, being there for your mates, remaining optimistic in the face of adversity and having a crack even when the odds are stacked against you. There's also a mardi gras scene celebrating optimism with the Bundaberg Rum team outside the Distillery with Bundaberg Rum employees and Bundy super-fans Rumbassadors. The $20m advertising campaign will continue for the next 18 months across multiple channels including TV and online.